This film without music would be much worse, because there is nothing supernatural here. Normal family who fights over the fact that they had an awkward relationship, simply because they are working hard and they are not synchronized in working graphics. In fact, everything revolves around this inconsistency, which is discussed from different sides and eventually the family comes to the decision that it is necessary to change their lives and they do this change, with the help of prayer and counseling of some women of old years. The musical accompaniment for the film made with the soul – here you can find pop, gospel, rock and even some of dubstep. If in two words to describe the whole collection, we can say that it is good and professional. 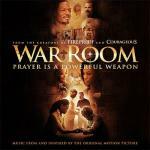 Song Warrior by Steven Curtis Chapman pleases with especial quality. Vickie Winans has a fairly strong voice that allows her to create masterpieces with one. Amen song is very, very excellent, better than most of the other songs of the genre. Me Without You is a good mix, really good. The collection includes 10 songs.